My little man LOVES mobiles, I can't imagine he's the only one. 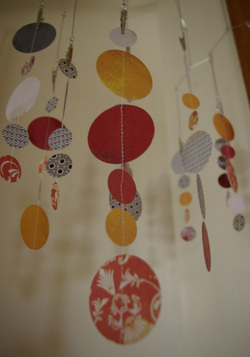 We have mobiles in every room of the house, seriously, they're everywhere. He was exceptionally crabby today (first tooth coming in) and I decided to make him something new to look at. This took us about one hour to make, from the very start to the very finish. If you don't have a baby in one arm the whole time, you could probably do it in less. Step 1 Pick out your papers. We used a total of 7 six inch square sheets of craft paper. Get creative! Pull out your stash! Use old wrapping paper! Step 2 Our paper was white on one side. If yours isn't, skip this step. We used our glue stick to glue two sheets together. I put pattern on one side and plain color on the other. Step 3 Once the glue is dry, start punching! We got 6 big circles and 10 small circles out of one sheet. You'll want at least 50 pieces all together. Step 4 Get some space and figure out how you want your pieces arranged. Vary the length, colors, patterns, and sizes. When you have them ready, stack them up so you know which is top and which is bottom. Step 6 Finish up! Trim threads and clip them to your mobile. Hang, and enjoy!